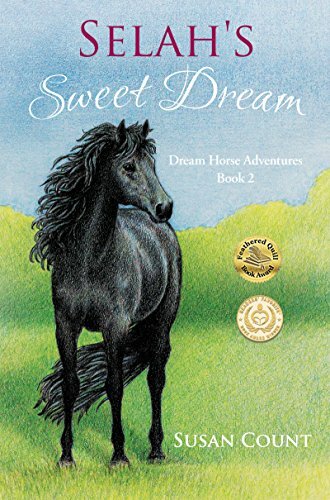 If you like the classic horse books; don’t miss this action packed read. Twelve-Year-Old SELAH (Say-la) aspires to be an equestrian superstar. That would require a horse.HER DILEMMA: Grandpa wants nothing to do with horses.THEN: Selah sees buzzards circling the grasslands behind Grandpa’s farm. They are stalking a horse trapped in wire and Selah is its only hope.DANGEROUS: The horse is wild and defiant – jeopardizing Selah’s dreams.FOILED: The legal owner searched for the horse for two years and wants it back.BUT: Selah is confident that God will provide her heart’s desire.MEMORIES: Grandpa shows Selah a video, from long ago, of a phenomenal equestrian. Selah declares that she wants to be like her and Grandpa explains the rider was her grandmother.HOPE: A world renowned horse trainer offers to train SweetDream and Selah.FOILED AGAIN: Her parents could ruin everything unless Sweet Dream’s unruly behavior ruins it first.LOST: Selah’s opportunity to mirror the equestrian talent of her renowned grandmother evaporates when the horse causes mayhem at the trainer’s facility.NEVER GIVE UP: Will Selah gather her courage and face up to the trainer to save her aspirations?